PS: Political Science & Politics provides critical analyses of contemporary political phenomena and is the journal of record for the discipline of political science reporting on research, teaching, and professional development. 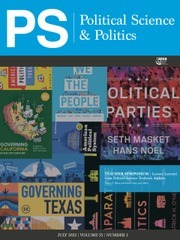 PS, begun in 1968, is the only quarterly professional news and commentary journal in the field and is the prime source of information on political scientists' achievements and professional concerns. PS: Political Science & Politics is sold ONLY as part of a joint subscription with American Political Science Review and Perspectives on Politics.